I am told the race in Shanghai was a bore, that nothing happened and it was a walkover victory for Lewis Hamilton. And so it was - there is no denying it. Bur it was also a welcome change in that there was no artificial drama created by idiotic stewarding decisions or political maneuvering; for once, we were allowed to have a grand prix without interference. The one slightly controversial incident was what we all knew would happen anyway - Raikkonen slowed to give up his second place to Massa. It could have been done a little less obviously but there was never any chance of the stewards complaining; it was Ferrari flirting with the definition of "team orders", after all. We all know the rule is unenforceable and should be done away with, therefore, but as long as the stewards ignore it, there is no harm done. My fear is that it lurks in the regulations, ready to be used to manipulate the championship when the FIA sees fit. Otherwise, everything proceeded according to the script, apart from the fact that McLaren had the edge on what is supposed to be a Ferrari circuit. That could have been due to the low temperatures and it is true that the Ferraris went for two stints on the medium compound tires, rather than the hards, in contrast to the other teams. Whatever the cause, the Ferraris could not challenge Hamilton on the day but Kovalainen was a different story. Smoking brakes on the grid indicated that the Finn had problems even before the start and so it proved. His retirement late in the race was probably a welcome end to a race that Heikki will want to forget. Renault continue to look good suddenly and it was a pity that Alonso did not quite have enough speed to catch Massa. That would have told us just how serious he was in his aim to help Felipe to the title - and I cannot see him not overtaking the Brazilian if the chance presented itself. BMW did well to salvage fifth and sixth spots on a circuit that Kubica's car especially did not like. The other teams had forgettable races, to say the least. So yes, the race was not one of the best but I maintain it was exactly what F1 needed. We have become so accustomed to interference from the officials that many of us were waiting to hear the announcement of stewards' inquiries after the race. Never mind that there was nothing worth investigating - that has not hampered their over-zealous approach in previous races. 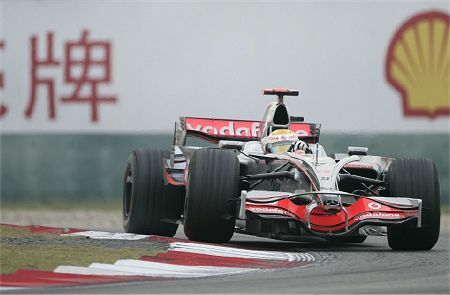 Shanghai was a reminder of the good old days when we could watch a race (no matter how boring) without even thinking about stewards. The day after the GP there is some political news, however. It seems the teams are wary of the forthcoming meeting with Mosley over his proposals for standard engines and so on; they are sending only Luca di Montezemolo and John Howett, to avoid the possibility of Mosley attacking FOTA's fragile unity. With some of the teams half-hearted in their opposition to Mosley's ideas, one can see why they want to ensure that agreements made in FOTA meetings are adhered to. The FIA have sent a letter to the teams outlining the agenda and it is far-reaching indeed. Cost cutting is given as the excuse, of course, but when it is considered that the document includes several proposals that will require the design and manufacture of new technology, as well as yet more changes to the regulations as early as 2009, one has to wonder whether there will be any saving on expenditure for the teams at all. To the fans, the proposals must seem like a recipe for changing F1 into a different thing entirely but, as usual, they will not have a say and must hope that FOTA is able to introduce some common sense into the debate. It is a slim hope but all we have. Regarding Max & FOTA I echo the comments of Alonso and Mark Hughes recent column in Autosport. If they (or Max) continue down this road of standardising everything then we'll just end up with GP2 with better drivers. In the past (albiet before my time) the grid was filled with wild and wonderful variations of car design which really let the engineers experiment and try to gain the advantage. Right now we have groups of engineers and vast amounts of money being spent on the smallest details to try and gain 1/2 a tenth (or less) with nothing visible to show for their efforts (except for cars which can't follow each other). It seems clear that a relaxation of the rules, no restrictions on engine, less restrictive bounding boxes for body work etc. and a budget cap would be the perfect way to go. If the FIA really believe that changing the rules radically every season (and then going back on them --- e.g. engine freeze/unfreeze) saves money then they are stupider than we thought. If they really want to have green ethics then extra money could be allowed to teams that utilize green technologies (e.g. turbos, the dreaded KERS etc.). Lets hope that someone sensible in the FOTA has similar ideas any manages to get their point across before it all goes wrong. It goes without saying yet somehow still needs to be said, if a driver voluntarily gives up a position to his teammate because he understands it’s the right thing to do, or it’s observing an agreement between teammates made before the race - very different from him being told - ordered - to do so, à la Barrichello in Austria a few years ago - then, obviously it's not "team orders” and does not contravene any rule. It’s only anti-Ferrari nitwits who see “controversy” in Kimi letting Massa by. Dave: I agree completely - the way forward is less technical regulation, not standardisation. If we wanted to watch GP2, we would. Green Flag: That's true, as far as you've gone. But the rule is there and it is subject to interpretation as to what constitutes team orders and what does now. Sooner or later the stewards are going to take it into their heads to penalise someone over this rule and then we'll have another huge debate. The best thing to do is to recognize that it's a stupid rule and get rid of it. What Ferrari did yesterday is what any team would have done and I have no problem with it. I had no problem with team orders in the first place come to that. However under the current stupid rules what Kimi did was illegal. The rules does not just cover team orders it covers drivers or teams doing things that artifically affect the race result. Schumacher voluntarily gave Rubens the win in Indy albeit he said he was trying to engineer a dead heat. THe rule is stupid and should be torn up and forgotten about but Kimi broke it. But I doubt anyone on the planet wants anything to come out of it. I certainly don't want to see a driver penalised for giving his team and his team mate a chance at a title. As a sportsman myself I can't abide what ferrari did by letting massa take kimi in such ridiculous fashion. I can understand it froma business point of view and if massa was faster or at least as fast as kimi I would understand from a sporting point of view too. However kimi was so much faster he had to slow by half a second on a couple of laps and lost 2 seconds in order to let massa past. He then followed massa around the rest of the race and lost no time to him at all. If they are going to do something like this then at least simply loose .1sec per lap or something similalry less obvious. The main problem though is that the rules are typically vague and the fans are again left in a position of not understanding what drivers can and can't do and what constitutes cheating and what does not. F1s rules need an overhaul and need to be as black and white as possible. Also these ridiculous phantom rules need to be ditched ot written down on paper. Anything which is not written down in the rule book should be exempt from punishment. I have a foot in both camps. I'm against team orders in general because they contradict the principle that this is supposed to be a competition with 100% effort. A properly-worded and implemented rule would be enforceable against all but the most discreet of orders, though it would only ever be a post-race investigation because of the amount of testimony that would need to be gathered and cross-checked. A rule banning deliberately slow driving would also help matters. However, I do think there should be an exception at the end of the season when one driver has a chance of the championship and the other doesn't. In that case, the ordered driver is giving the championship challenger the best shot possible at a time when the ordered driver cannot challenge for it So I feel OK about what Kimi did today, but not if it had occurred before Raikkonen mathematically dropped out of the title race. A clearer rule would be a lot of help for everybody. It's also typical, if well-precedented, that the stewards did not enforce the rule in the books when there was a clear violation (Kimi had no trouble going quickly before Massa was 3rd and sped up a fair bit - though not to his pre=Massa pace - afterwards). I can see both sides of the argument but nothing convinces me that a rule regarding team orders is enforceable in a fair and reasonable manner. The only practicable way forward that I can imagine is to just scrap the rule and allow teams to do as they will. In the fifties, when Mercedes and Ferrari dominated at times, it was customary for them to have their cars cross the line in formation, an orchestrated demonstration of superiority. Mention has been made of the car-swapping that used to go on, some of which actually decided championships. Team orders are a part of F1 and the fans know this. It is only those who are new to the sport and those who gamble who squeal when results are manipulated to suit the winning team - so it was ignorance that drove the FIA's decision to introduce the rule in the first place. It should be scrapped as completely unworkable.